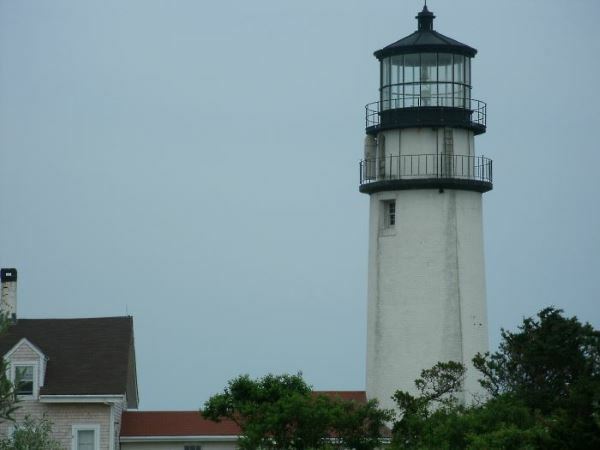 Our favorite Cape Cod restaurants have something special, beyond just good food at a reasonable price. Breakfast tastes so much better out in the salty air. And where else but a restaurant on Cape Cod would you find dinner served on a Frisbee? 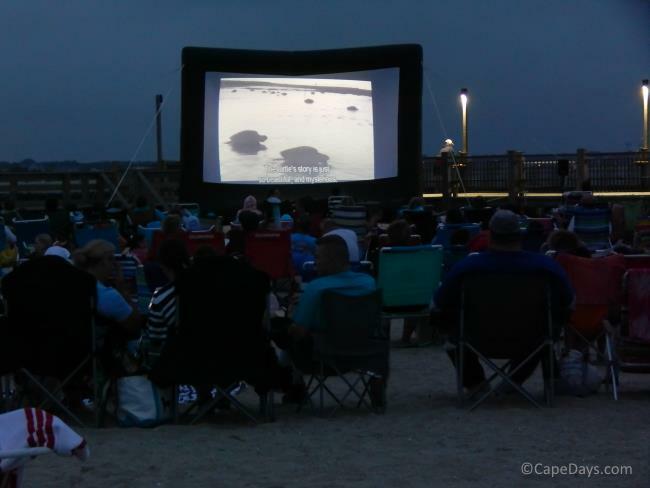 We love our Cape Cod food with a side-order of fun! 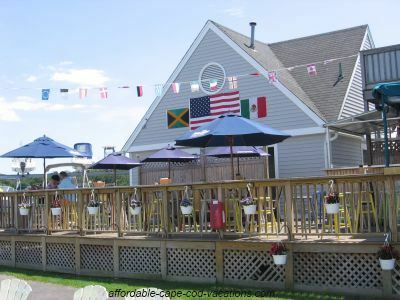 With its panoramic view out over Hyannis Harbor, the Dockside is one of our favorite Cape Cod restaurants for an inexpensive "breakfast with a show". There's always something going on in Hyannis Harbor. 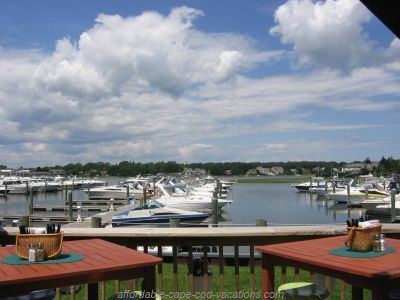 And a table on the outdoor deck at the Dockside is the perfect place to take it all in. As you chow down on your eggs and toast, you'll see ferries on their way to the islands, fishing boats unloading their catch, and luxury yachts motoring past Lewis Bay Lighthouse. Breakfasts like the Harbor Starter - eggs, pancakes, hashbrown potatoes, toast and bacon or sausage. Or Harbor French Toast - thick cut and topped with creamy whipped maple butter. And my personal favorite - Seafood Eggs Benedict. Poached eggs on top of yummy seafood cakes, and topped with hollandaise. M-mmmmm! The Dockside is just steps away from the Steamship Authority ticket office and pier. (97 steps away. I counted!) 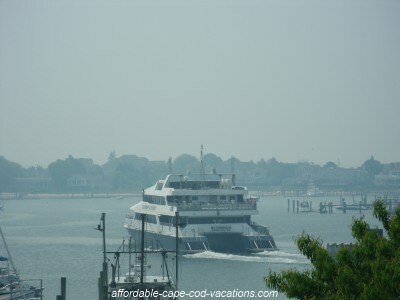 So it's a great place to stop for a bite to eat before or after your ferry ride to Nantucket or Martha's Vineyard. Open seasonally for breakfast, lunch and dinner. As you might have guessed from the name, "hangar B" (yes, the lower-case "h" is correct!) 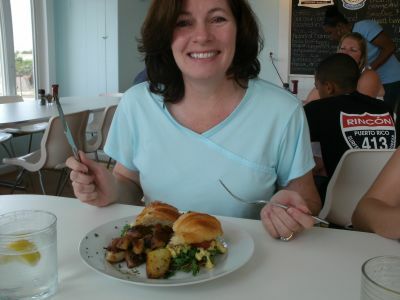 - is the restaurant at our small, local airport in Chatham. Who doesn't get a kick out of watching planes take off and land? Kids love it - and I do, too! Everything is gourmet quality and beautifully presented. The Brioche Bread Pudding French Toast is rich and luscious. But my favorite has to be the Lemon Ricotta Pancakes. They're beyond delicious. This isn't your average airport restaurant fare, by any means! Eggs, Avocado, Tomato, & Cheese on a Fresh Croissant ... Mmmm!!! The Rail Trail bike path winds past the airport, making Hangar B a perfect breakfast/biking destination. What better way to work up an appetite, then exercise off the resulting calories? Open for breakfast and lunch daily in July and August. Reduced hours off-season. This is one of the more "out-of-the-way" Cape Cod restaurants, and a true local favorite. You'll find it in a converted farmhouse on Route 28A, the scenic side-route between Bourne and Falmouth. 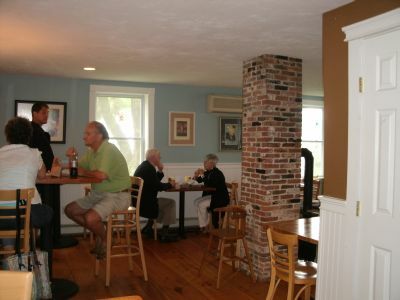 Daily Brew is a comfy, homey and friendly coffee house. Indoors, it's a bright and airy, beachy atmosphere on the first floor, and a warm, relaxing retreat upstairs. Outdoor seating includes picnic tables, and a patio overlooking lush gardens and grounds. Chess and checkers boards are provided for customers who're in the mood to play - and there's free WiFi, too. Everything! The breakfast burritos and breakfast sandwiches are loaded with fresh local ingredients. The homebaked muffins and pastries are amazing (try a cranberry orange yogurt muffin - you'll see what I mean). Or go for a healthy treat with an "Up & At 'Em" oatmeal, banana and raisins smoothie. Sounds odd - tastes fantastic! The Daily Brew is very family friendly, and unbelievably wallet friendly, too. Summer Shanty is a great place to stop when you're out and about exploring historic Bass River. After a morning on Bass River - kayaking, fishing, or just enjoying the view of windmills, waterfront mansions, and all sorts of wildlife - lunch at the Shanty is always in order. 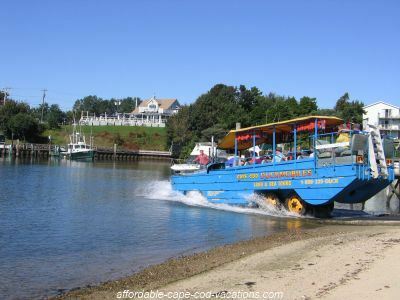 There aren't many waterfront Cape Cod restaurants that offer dining dockage for their customers. But the Summer Shanty does. Of course, you can also drive to the Shanty. Just take Route 28 to West Dennis, and watch for the Windmill Plaza. When you see the plaza's big windmill, look across the street for signs to Bass River Marina and the Summer Shanty. My favorite Shanty lunch is a crispy fried fish sandwich, served with fresh lettuce and tomato, and a hearty portion of really good french fries. Thick cut fries. Cooked to perfection - not at all greasy. My hubby loves their burgers, with fish and chips running a close second. Of all the boat-up Cape Cod restaurants in the mid-Cape area, we prefer the Summer Shanty for its excellent service, good-sized portions, and quite reasonable prices. The porch and lawn at the Summer Shanty are also great places to relax with a cocktail and watch the sun set. 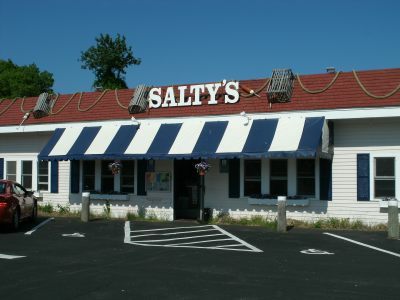 Salty's is one of our "go-to" Cape Cod restaurants in the mid-Cape area for a quick bite to eat in a comfortable, clam shack-y atmosphere. 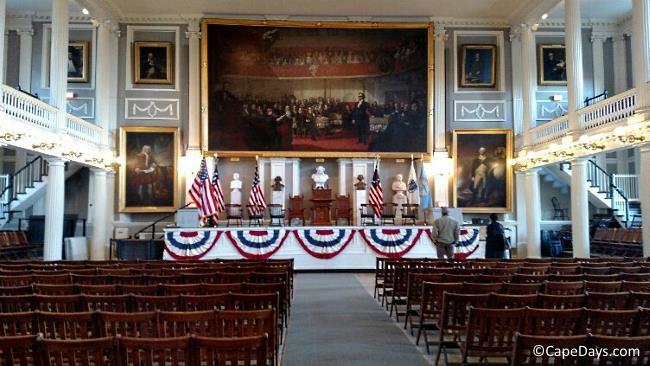 Remember at the top of this page where I said: "Where else but Cape Cod would you find dinner served on a Frisbee?" This is the place. As soon as you walk into Salty's, you get a definite seaside vibe. Kind of a combo Cape Cod-Key West flair. 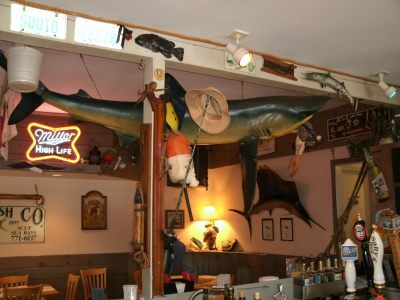 From the enormous shark hanging over the small 6-seat bar, to the adorable little chipmunk who scoots around begging food from soft-hearted patrons on the outdoor patio - Salty's is "one of a kind" when it comes to Cape Cod restaurants. See the arm hanging out of the shark's mouth? It's fake ... I think. Have you ever heard of a Cape Cod Reuben sandwich? No? Neither had I, until we discovered Salty's. Believe it or not - the combo of sweet batter fried cod, sauerkraut, melted cheese and thousand island dressing, all grilled together on sliced marble bread - is really good! For less eclectic appetites, Salty's has a full menu of seafood dishes, a variety of sandwiches, burgers and desserts. Important Note: Restaurant menu selections, prices, days/hours of operation, etc. do change from time to time. Please be sure to call or visit the restaurant's website for the most current info before venturing out!